At piano, S10 worked on her pieces for the recital we are hosting Sunday. She and I are going to play piano, along with A9. O8 is going to play violin and T8, Nelya’s son, may also do a violin piece. He has just started playing so she’s not yet sure if he is up to performing. It will be here at our house with a barbecue afterwards. The families and teachers are coming and will be a nice, casual affair. S10, Nelya and I decided together that S10 should not perform “Let It Go” at the recital. She really can’t even play it through yet, which is largely due to the fact that it’s a difficult song for her level and she hasn’t been playing it for very long. She is disappointed, but agreed that it would be better to hold off and play it once she has polished it. That said, it is coming along and she should be able to play it by the end of summer if she practices. She will perform three pieces: “Race Car Rag”, “Ode To Joy”, and “Home on the Range”. My turn was next. I played the C# Major scales and arpeggios. I will do the dominant 7th arpeggios for next lesson and begin D# minor scales. I also played through the Beethoven Variations parts 1-5. Var 1 & 2 (the technical pieces) need to be practiced at a very slow and even tempo to get the timing even. I also need to work on Var 3 & 4. Finally, I played my recital piece, the Mozart Fantasie in D minor. I love this piece. I have been working on it for six months (it’s hard to learn new pieces when you’re my age!). It is finally memorized and I generally play it through without any major mistakes. The alberti section still gives me timing trouble, but it is going to be okay for this small recital. We stopped by Young Historians next and picked up the materials for the Greece unit that we missed. 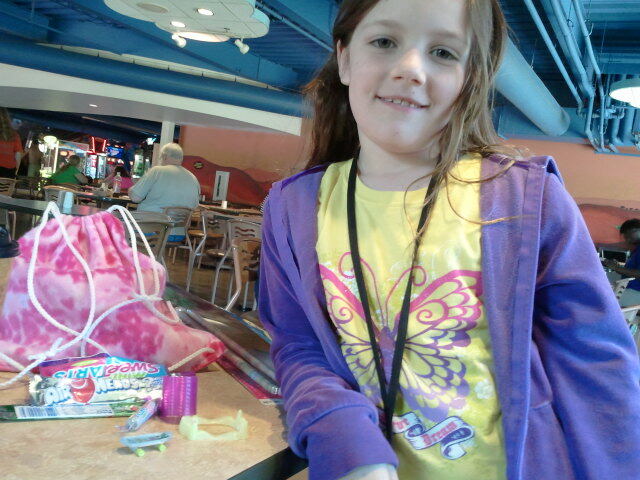 The class was cancelled, but we were at Kalahari during the rescheduled time. We’ll be at Space Camp during the other possible make up time. Summer is supposed to be relaxing, but our calendar is jam-packed all of a sudden! We will go over Greece together over the next few weeks. I am excited to see what Ms. Laura plans for the next Young Historians club. In the afternoon, we went to O8’s lesson. She was having a hard time focusing, so I went outside with S10. It sounded like she and Tina worked on the Maccabeus Chorus. I think they plan to play it as a duet on Sunday. She also brushed up on Etude and the Minuets. Her recital pieces are “Chorus” and “Minuet 3”. Today was our last day at Kalahari. It was hard to say goodbye, but it will also be nice to sleep in our own beds tonight. 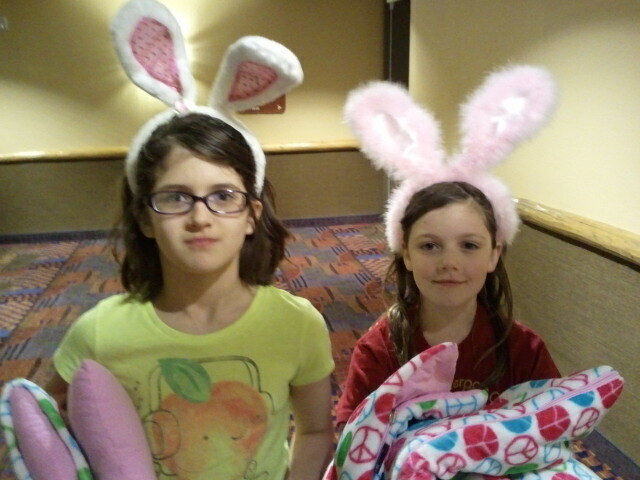 We checked out at 11 and loaded the vans, then L & I let the girls burn up their arcade and gift cards. We started in the arcade. This year, the girls were old enough to go by themselves. They used their own money to charge the arcade cards and my two shared a 40-credit card that we got for having lunch at the resort’s restaurant. Periodically, they would pop in to the cafe where L & I waited, and showed off their tickets and prizes. I think it was a great confidence-booster for all of them, but especially the younger two (A9 and O8), who are both rather shy. After the arcade, the kids took their $20 gift cards (they received those for hosting the Wild Imagination funshop) to the gift shop. S10 picked out a mermaid doll with matching purse; O8 chose a small stuffed cat. The balance was spent at the candy counter. We stopped for lunch at Panera in Sandusky with L & A9, and made it home by 5:30. Goodbye til next May, Kalahari! 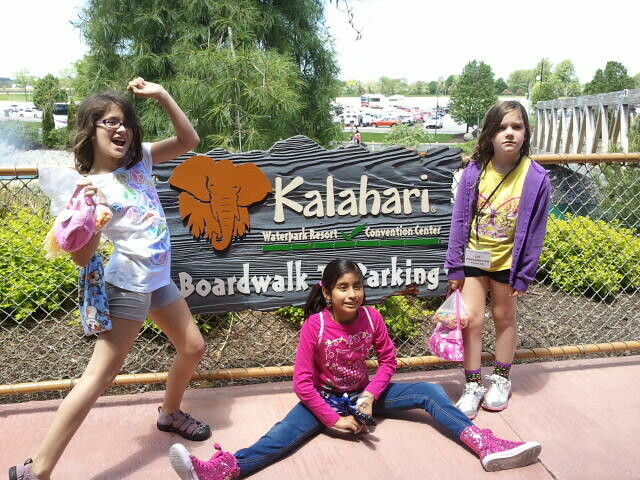 Today was Thursday of our week at Kalahari. We are here for the annual Unschoolers Waterpark Gathering. 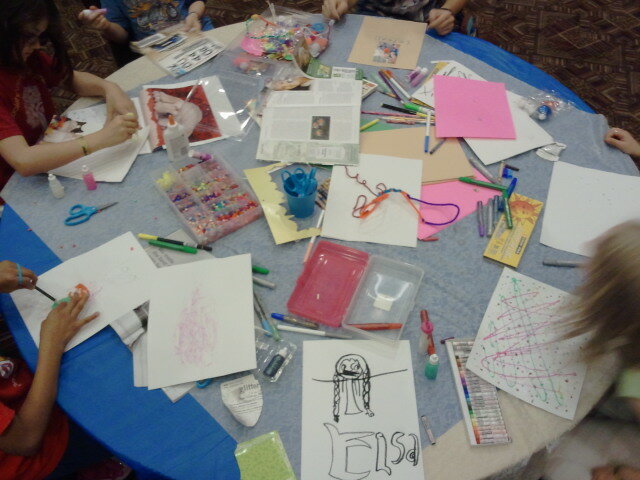 This morning, the girls hosted an art funshop that we called “Wild Imagination”. We collected magazines and other collage materials for this funshop. 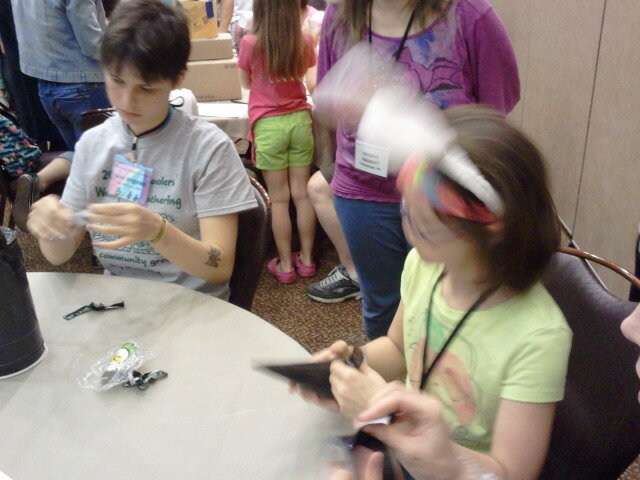 We also brought scissors, glue, glitter, paper, and a box of odds and ends for kids to collage with. 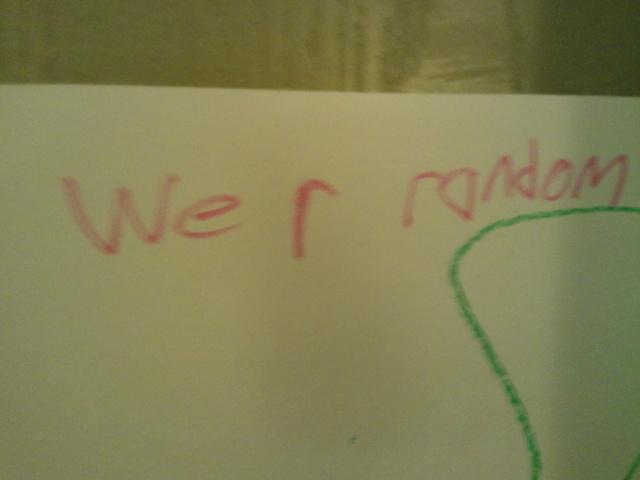 Our funshop coincided with the Nerf war, so it didn’t have as good a turnout as last year. But it was still a lot of fun. 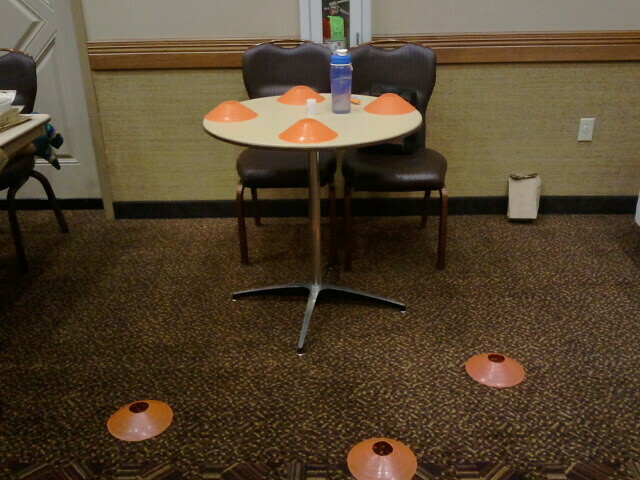 We had about four active collage tables plus an impromptu Nerf range at the back of the room. 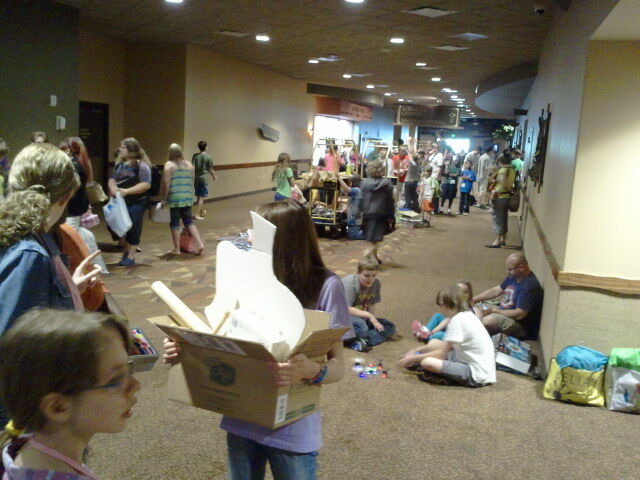 After the funshop ended and we collected our supplies, we headed back to the room. 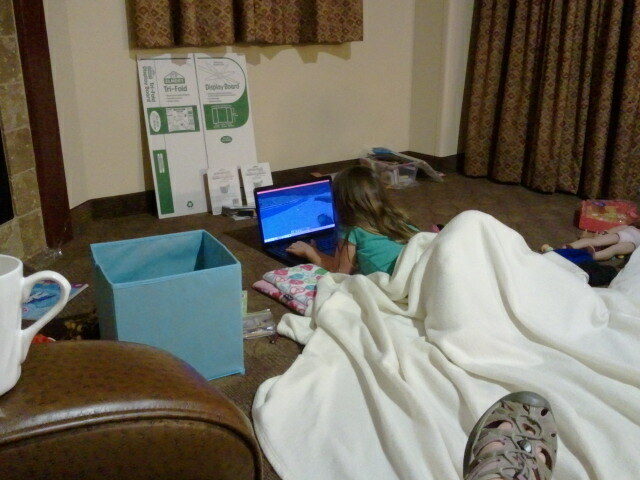 O8 and I decided to give the waterpark one last go, while S10 and A9 stayed in the room with L and worked on Minecraft projects. After O8 and I got dressed, we all headed down to the Reserve for dinner. 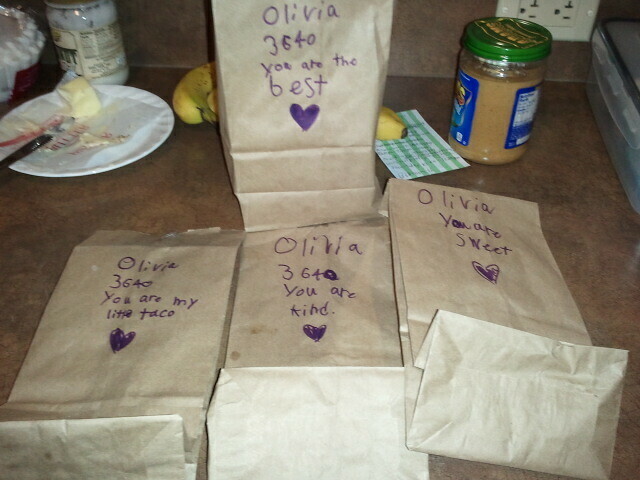 The kids dropped off their Fairy Good Parent gifts on the way. Speaking of Fairy Good Parents, O8 received quite a few gifts this week from her secret person. 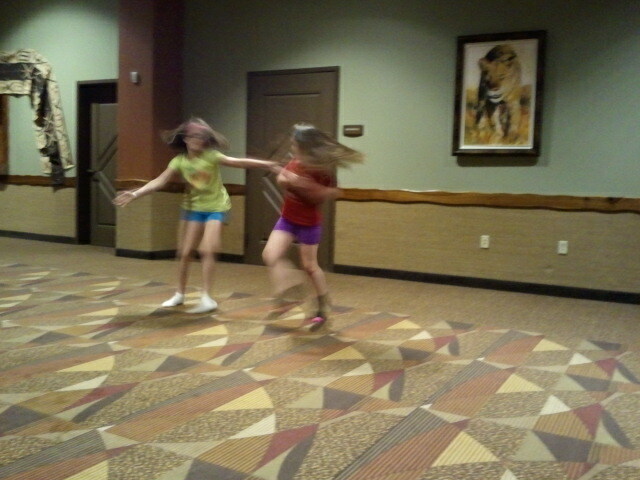 After dinner, we headed back downstairs for the talent show. A9 and S10 each performed a dance. A9’s was to a Minecraft parody of “Let It Go” (from Frozen) called “Glowstone”. S10 did an extemporaneous dance to “Counting Stars”. 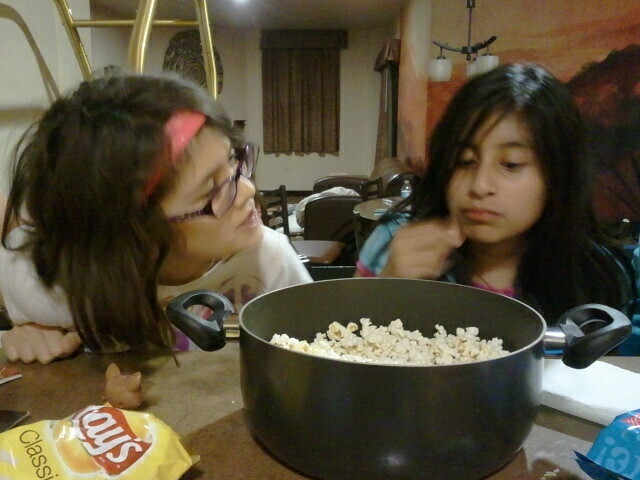 We headed back up to the room after the talent show and made a late night snack of stovetop popcorn. Then we packed a few things in anticipation of leaving tomorrow. Sad face. 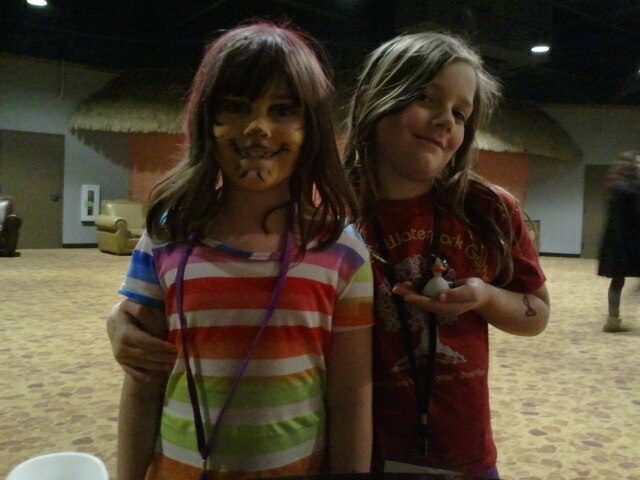 Today was the Wednesday of our week at Kalahari and the Unschoolers Waterpark Gathering. 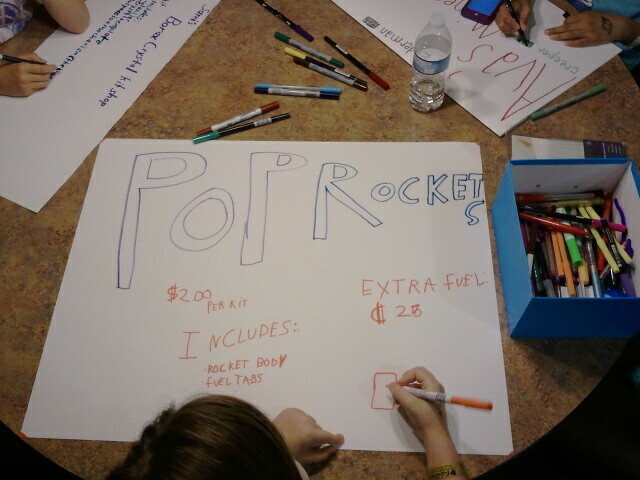 We spent some time this morning getting ready for the Kids’ Marketplace. 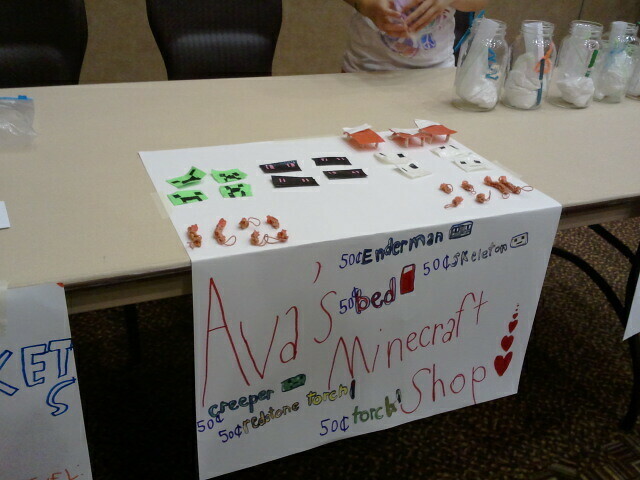 A9 made some duct tape projects, all Minecraft related, for her shop. 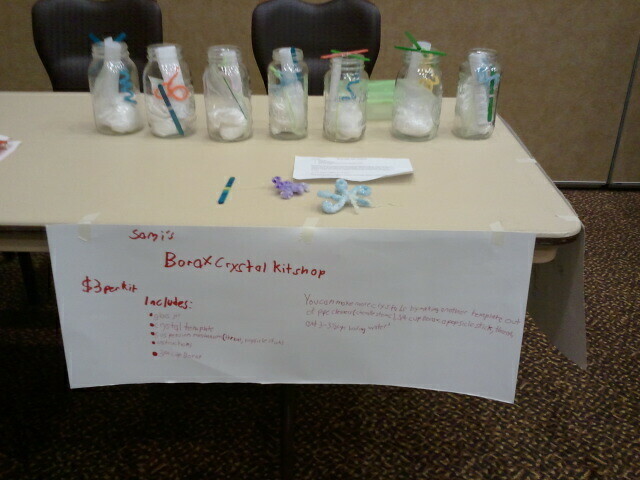 S10 made borax crystal kits with canning jars and chenille stems. 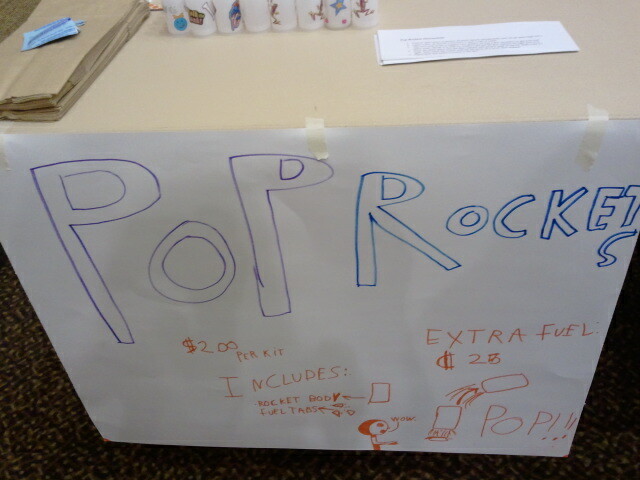 O8 made pop rockets, which were a big hit at S10’s Space birthday party a couple years ago. 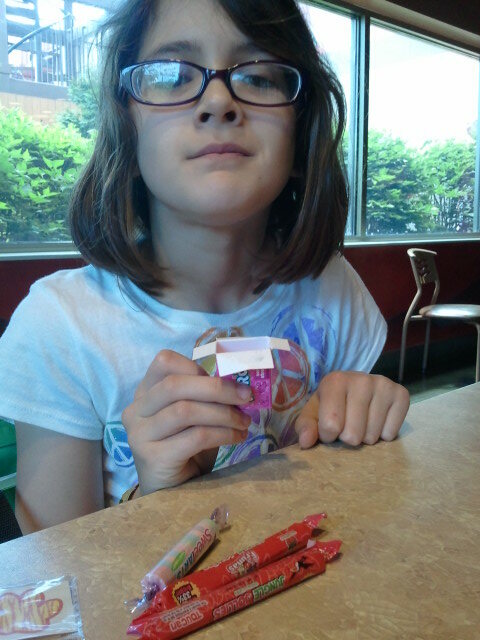 The kit included a film canister (which she decorated at home) and two generic antacid tablets. 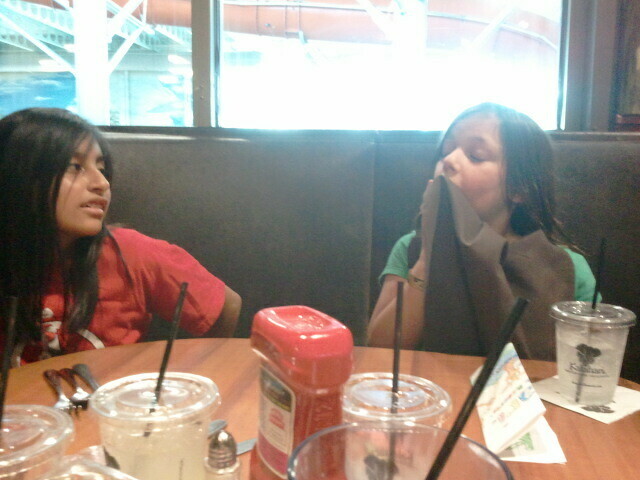 The girls shared a table and took turns watching each other’s shops and visiting the rest of the marketplace. This is such a neat venue for the kids. They participated in every aspect, from “product development” to sales. 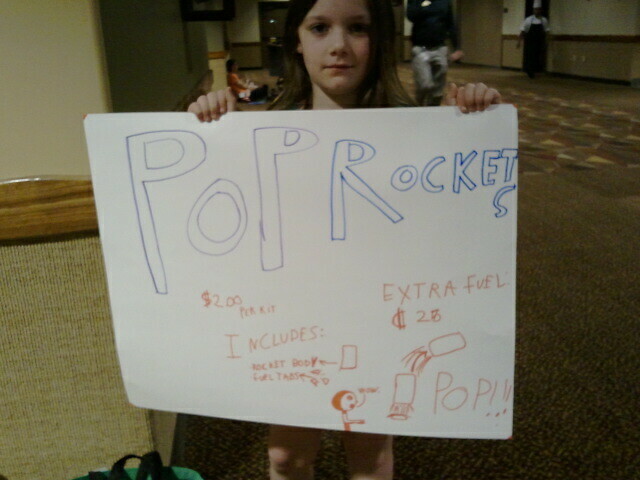 All three did well, but O8 cleaned up with her pop rockets: she sold 14 of them at $2 apiece, plus a bunch of extra fuel tabs. She plans to spend her cash at the arcade later. 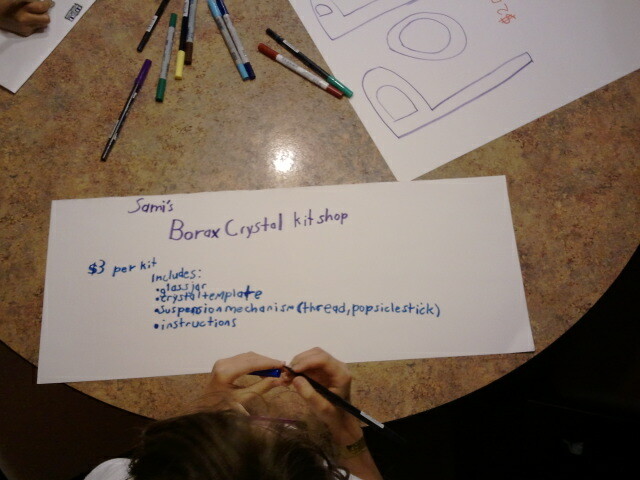 S10 sold 6 crystal kids at $3 each. 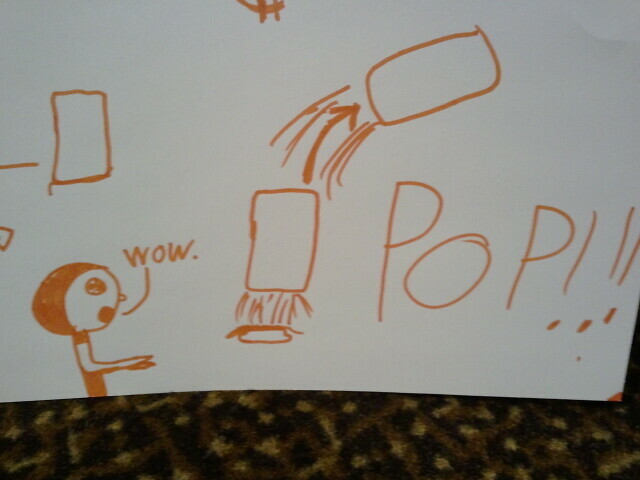 A9 also sold a number of pieces. 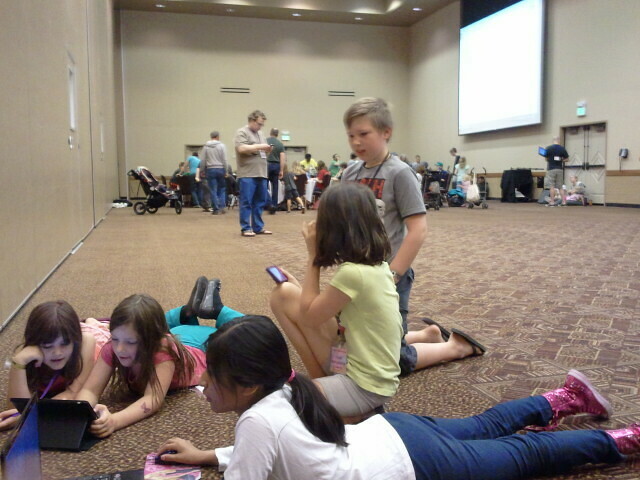 In the evening, we went to the dance for a short while, then headed back to the room for some card games and Minecraft. 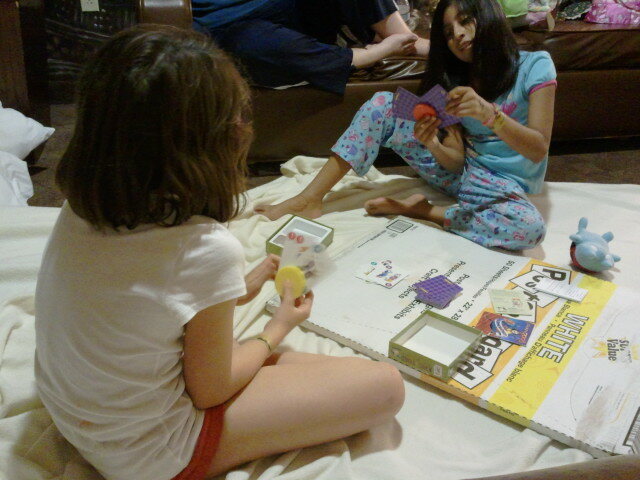 Today was the Tuesday of our week at Kalahari and the Unschoolers Waterpark Gathering. 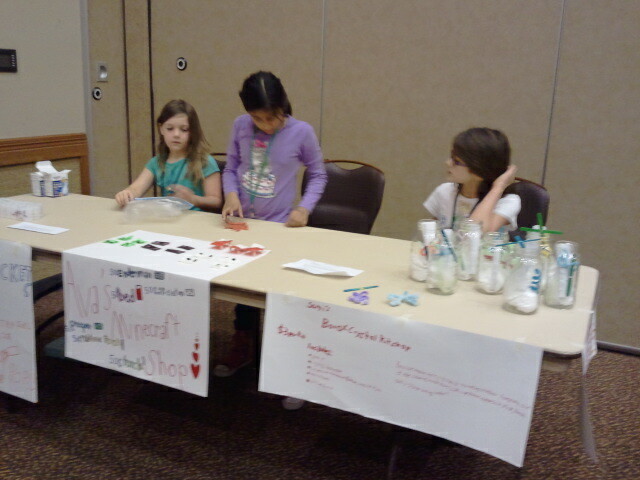 This morning, we attended the Minecraft funshop. 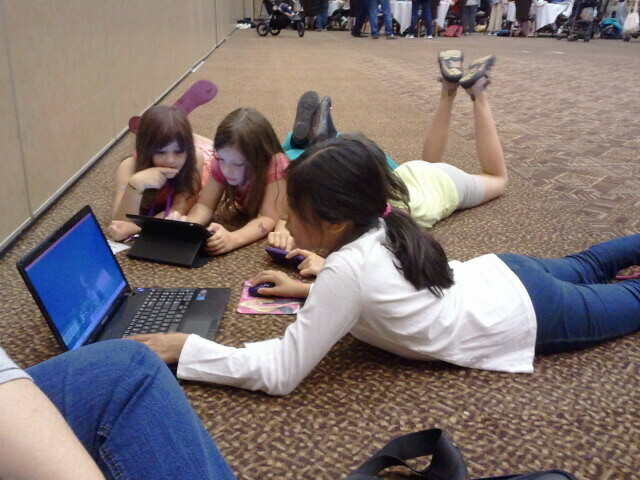 A9 was kind enough to let us use her iPod and iPad to play the Pocket Edition. She joined the Unschoolers server and played on her regular laptop. The kids have played before, but they really got a good glimpse of what goes into making and hosting a server. The funshop host, Brandon, was very generous with his time and made sure everyone had a chance to play. Later, we went to lunch at the Reserve restaurant in the resort and then spent some time in the waterpark. In the evening, we went to the movie (Frozen) and hung out at the henna fun night. 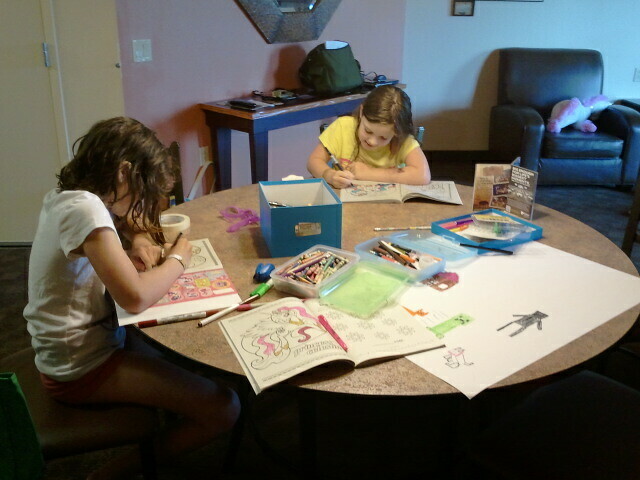 The kids also got in some coloring and art time with their friend. Today was our first full day at Kalahari. 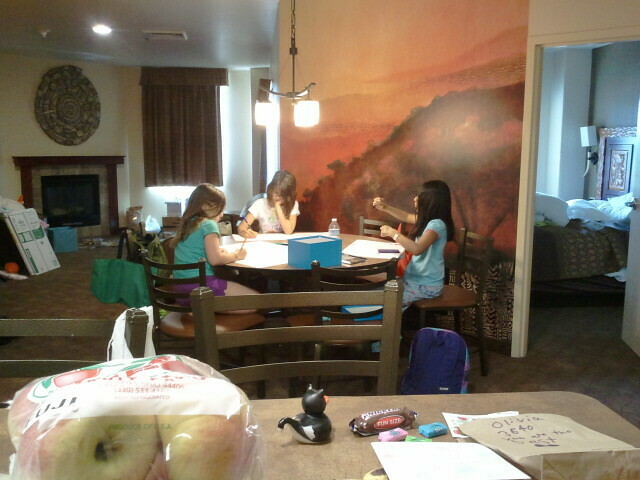 We are here for the 7th Annual Unschoolers Waterpark Gathering. This is our fourth year attending this super fun event. We spent most of the morning at the waterpark. The girls are both tall enough to ride all the slides, and we pretty much did just that. In the afternoon, we headed back to the room and had lunch. 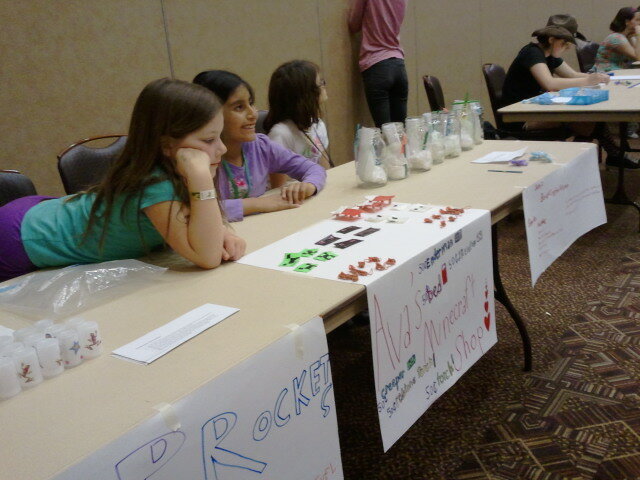 Then we went down to the convention center to register, sign up for the Fairy Good Parent game, and volunteer some time. The kids did a lot of twirls and cartwheels in the open space. They also dressed up for the occasion. 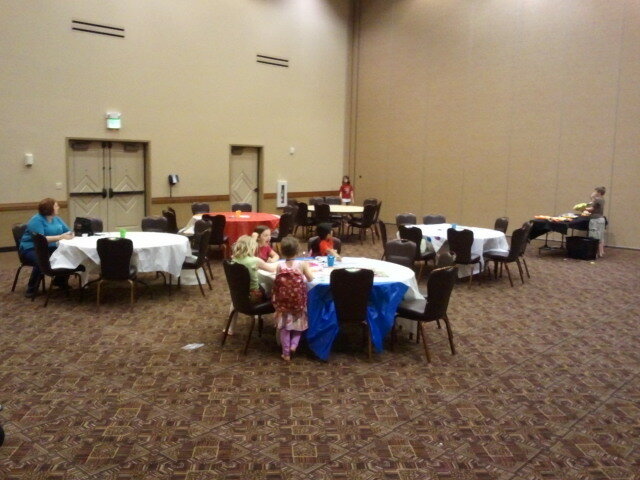 I attended the opening speaker (Ken Briggs) while the kids played Zombie Tag in the corridors. Good thing we have the whole convention center to ourselves. After the speaker, we divided up into groups based on the color of our nametag’s lanyard. Ours was black. We had to make a duct tape sculpture with the rest of our team. 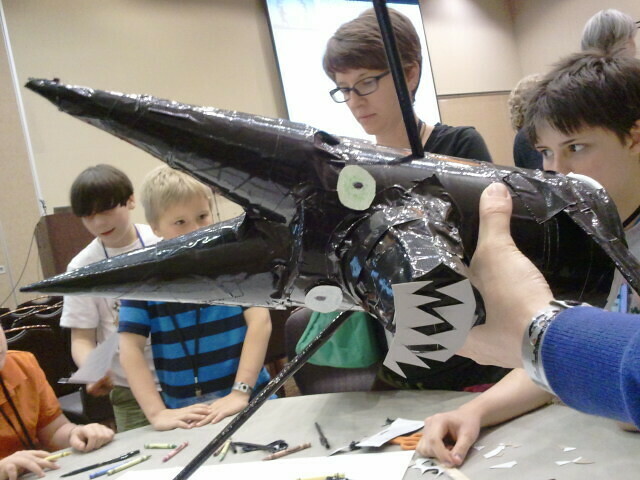 The black team made a toothy pointy-eared wolf cat thing. Later, we went to the family fun night. O8 made a friend, Trinity, who came all the way from Georgia. They were fast friends the whole night (eta: the whole week). Finally, around 10PM, our roommates arrived. 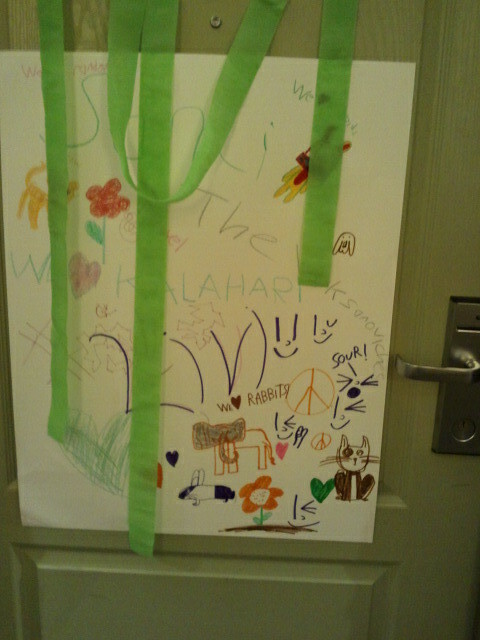 L and A9 were sharing the adjoining hotel room next to our kitchen suite. 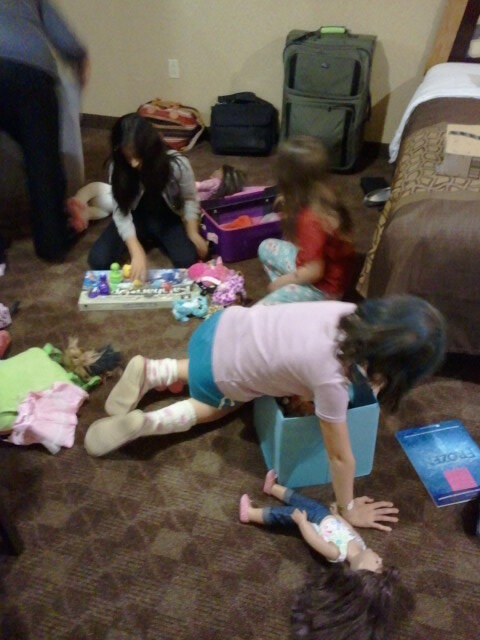 We were very excited to see them and “helped” them unpack. Needless to say, it was rather late when everyone finally fell asleep. 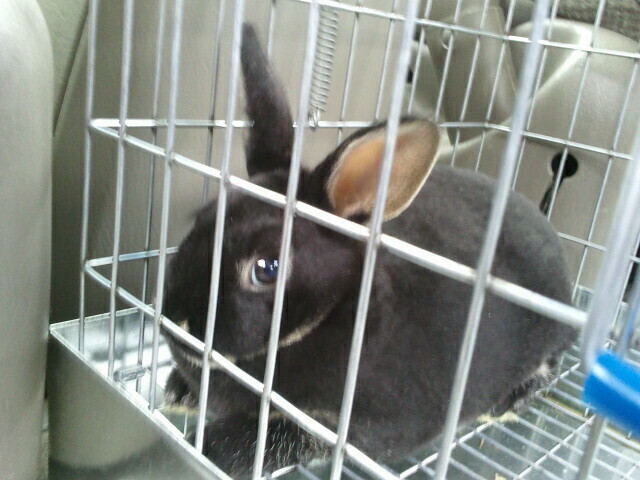 Today we drove up to Meadville to visit a rabbitry, so that S10 could get a new bunny for 4H. Bullseye, who turned out to be a lot older than we thought, passed away April 26. 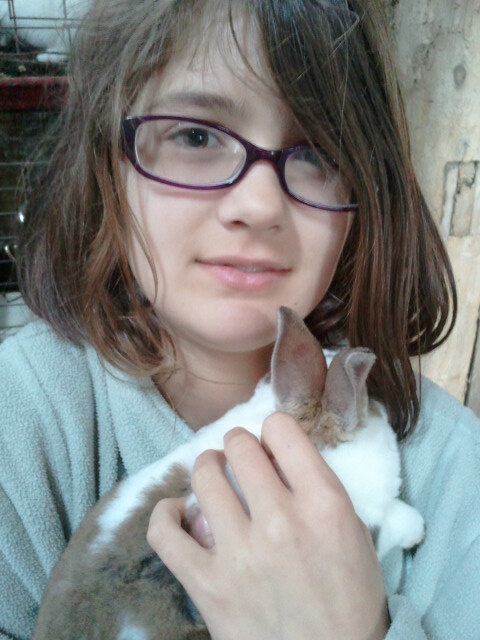 The rabbitry is run by a 4H leader and she was very pleased to hear that was why we were looking for a bunny. S10 looked at several mini Rexes and a few mini Lops. It was a very hard decision. But then we spotted a cage of black mini Rex, and one was a doe (our preference). O8, meanwhile, fell in love with a cat named Lucy. I would have taken Lucy home if we could. 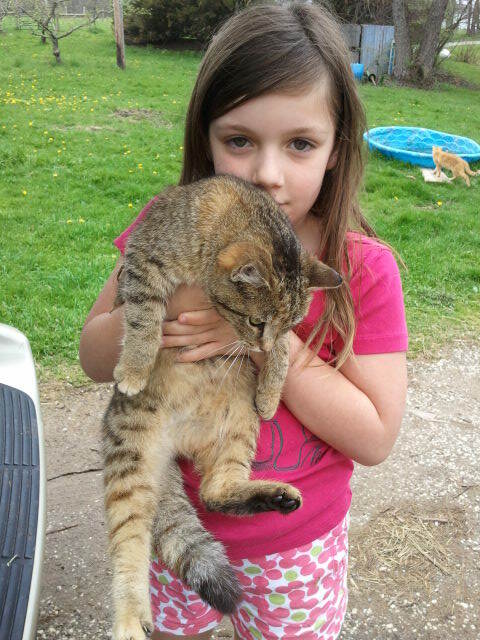 She was a super nice cat. In the end, we purchased this little cutie for $15. We are still thinking of a name for her.